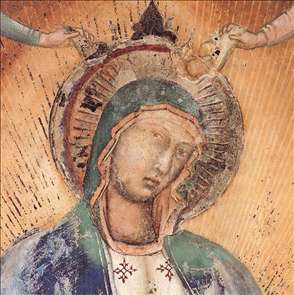 Sienese painter, the pupil of Duccio, who developed the use of outline for the sake of linear rhythm as well as the sophisticated colour harmonies implicit in Duccio. 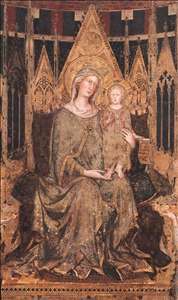 He was also deeply influenced by the sculpture of Giovanni Pisano, and even more by French Gothic art. 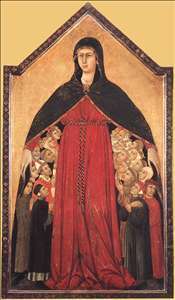 His first work was a large fresco of the Maestà (1315, reworked 1321) painted for the Town Hall of Siena as a counterpart to the huge pala by Duccio in the Cathedral. 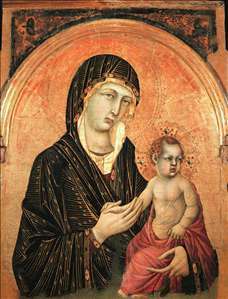 This shows the formative influence of Duccio on him, but there is already a perceptible Gothic influence in it which is much strengthened in his next work, the St Louis of Toulouse (1317, Naples). 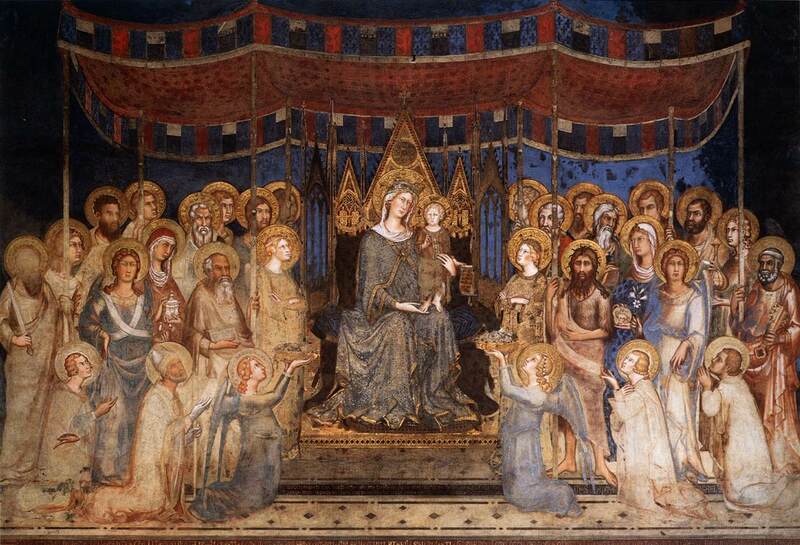 At this date Naples was a French kingdom, ruled by Robert of Anjou, who sent for Simone and commissioned him to paint a new kind of picture: Robert s claim to the throne of Naples was not impeccable, and he therefore caused Simone to paint a large votive image of the newly canonized St Louis of Toulouse (a member of the French Royal house) shown in the act of resigning his crown to Robert. 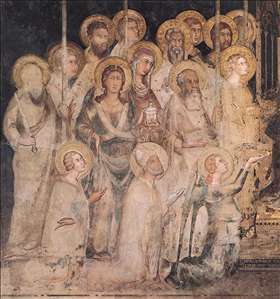 At some date not yet established Simone went to Assisi and painted a fresco cycle in S. Francesco, of scenes from the life of St. Martin, which again show both the interest in French Gothic art and the sense of chivalric pomp that distinguish Simone. His best-known, and perhaps his finest, work is the Annunciation (1333, Florence, Uffizi) which was painted in collaboration with his brother-in-law Lippo Memmi (d.1357). Lippo often worked with him, but in this case they both signed the picture. 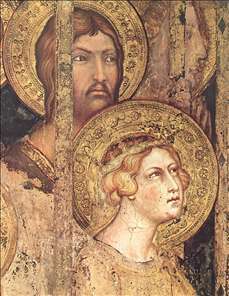 It is perhaps the most splendid example of pure craftsmanship produced in Siena in the 14th century, with its elaborate tooling of the burnished and matt gold, but it is also an almost abstract essay in pure line and two-dimensional pattern, at the furthest possible remove from either Giotto or even their Sienese contemporary Ambrogio Lorenzetti. In 1340-41 Simone went to France. It seems that he went on official business, and not as a painter, to the Curia at Avignon, where the Papacy was then established, and in this Franco-Italian enclave he spent the rest of his life. There he painted the jewel-like Christ Returning to His Parents after disputing with the Doctors (1342, Liverpool), a most unusual subject that perhaps once formed half of a diptych. 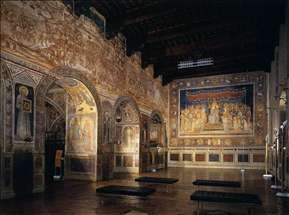 In Avignon he met Petrarch and became friendly with him, illustrating a Virgil codex for him (Milan, Ambrosiana); he also painted frescoes in Notre Dame des Doms, of which the synopias remain (now in the Palais des Papes). They are probably datable in 1341. His influence on French 14th-century painting is hard to assess, but a century later the Sienese (so Ghiberti informs us) regarded him as their greatest painter. 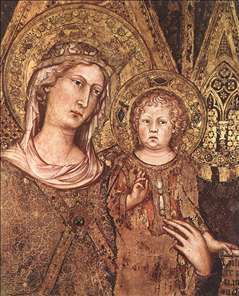 See more details about "Madonna and Child (no. 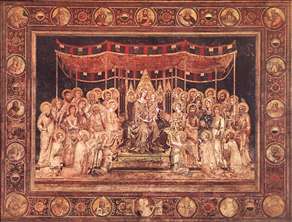 583)"
See more details about "Madonna in Glory with Musician Angels "
See more details about "Madonna of Mercy"
See more details about "View of the Sala del Mappamondo"
See more details about "Maestà (Madonna with Angels and Saints)"
See more details about "Maestà "